Help us give more kids lights by buying some for yourself or as gifts! A copy of an article we wrote appears in the AS&R Documents page and on our International Bike & Walk to School Day page: WT-November.pdf. 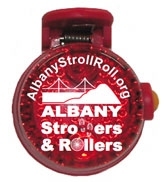 Help kids and adults ride more safely and light up the Albany night! FREE FRONT LIGHTS COURTESY OF SAFEWAY! Thanks to Safeway’s generous donation to underwrite 1000 front lights over the past two years, we are now able to offer free front lights, MSRP value $39.99. For every light that we give away, an Albany school kid will get one free. We many front lights at the Arts & Green Festival and the Solano Stroll – we still have some available so come to an event or contact us! At 2010 & 2011 International Bike & Walk to School Days, AS&R volunteers and school parents installed more than 400 front lights. This was a fantastic payoff to a great program!